Vancouver Canucks' D Sami Salo has suffered a ruptured testicle in Sunday's Game 5 win in Chicago. Salo blocked a shot late in the first period from Duncan Keith that initially appeared to be a wrist or abdominal injury. He lay prone on the ice for quite some time, writhin in pain in fact, before being escotred to the ice. Speculation was that me may return but that was quickly put to bed as he was taken on a stretcher to a Chicago hospital for further evaluation. 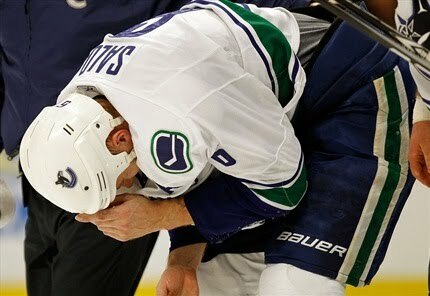 TSN is now reporting, as is the TEAM 1040 radio in Vancouver that Salo suffered a ruptured testicle. There is no further word at this time on his status. However, according to a quick google search, a "testicular rupture [...] is a rare type of testicular trauma. This can happen when the testicle receives a forceful direct blow or when the testicle is crushed against the pubic bone (the bone that forms the front of the pelvis), causing blood to leak into the scrotum. Testicular rupture, like testicular torsion and other serious injuries to the testicles, causes extreme pain, swelling in the scrotum, nausea, and vomiting. To fix the problem, surgery is necessary to repair the ruptured testicle." Salo's absence for Game 6 likely means Aaron Rome will draw back into the lineup. O'Brien will be fine from his six stitches he received and will likely play alongside Christian Ehrhoff while Alexandre Edler may be paired with either Aaron Rome or Kevin Bieksa, leaving Alberts with Bieksa or Rome on the third pairing. NOTES: This injury would be Sami Salo's 39th in his career. Poor Salo made it quite awhile in this post-season before suffering a set-back. Hopefully his recovery is as speedy as his slap shot. Just when we thought his luck couldnt possibly get any worse...wow, he so does not deserve this. Salo has been extremely steady for us - a big loss. Interesting to note the Jordan Hendry barely plays for the Hawks too, so their D may get worn down a bit also. Here's hoping Aaron Rome can fill in admirably!